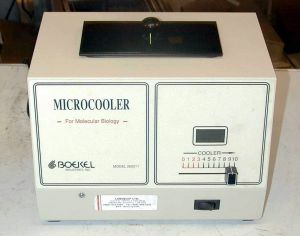 Product Description The Boekel Microcooler provides a simple, reliable and inexpensive way for molecular biologists to maintain the temperature of micro samples. LCD readout provides continuous readings accurate to 0.5C. The temperature range of the Boekel is +20C to +4C (with cooling well filled with 1" of water). This Microcooler includes one 21-place test tube rack for microcentrifuge tubes (7mm OD).